Behemoth.com is a new audio and video media download site that has great potential. Here is what it says about itself. Behemoth.com’s vision is as big as its name: to provide a large-scale, cost-effective download venue for customers of all ages, featuring trustworthy, downloadable audio and video content for the Christian family. Enjoy a wide selection of media, including music, feature films, audio dramas, sermons, and more! Similar to ChristianAudio.com, Behemoth doesn’t appear yet have the amount of content that ChristianAudio does, but it offers a wider range of media including sermon series, music, movies and other video content. It also seems to have much more discernment in the selection of content. Want to understand the core themes and key lessons of the book of Job? Mark Dever’s 4 sermons on the book of Job does just that, and he carefully applies these lessons to our lives with great insight. Mark also does a masterful job explaining Job’s sin of questioning God’s hand in the face of Job’s own supposed righteousness. Job’s questioning of God was a form of sin, but Mark pastorally helps us to see when questioning God is sin and when it is not. Job’s repentence before God is an incredible picture of a man submitting himself and his sense of fairness before a holy God. John MacArthur mp3 library soon to be free! Justin Taylor breaks the news that Grace to You will make all of John MacArthur’s mp3 sermons free for download beginning on November 5th. This will be a tremendous resource for the church. Thank you John and Grace to You! Calvin Seminary hosted a conference this past September which reflected the life and teaching of Herman Bavinck, who was a contemporary of B. B. Warfield. There are 13 messages to the conference. I have not listened to any of these messages yet, as I have an iPod full of material at the moment, but I will be checking this out soon. Unfortunately these lectures are in Real Audio Media format. There is also an interview on file at Reformed Forum, interviewing Dr. Ron Gleason who has a biography soon to be published on Bavinck. Edmund Clowney’s daughter, Rebecca Jones, is gathering all of her father’s audio sermons and lectures, and is requesting anyone who has audio files of Edmund Clowney to contact her at: perejones@sbcglobal.net. We do have the the resources at Sermon Audio, Westminster Theological Seminary, Trinity Presbyterian Church, Christ the King Church, Westminster Seminary CA, and Reformed Theological Seminary. Faith by Hearing will keep you posted as this material is collected and made available. 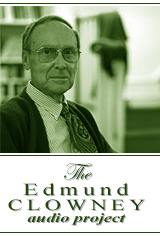 Sermon Audio now has 95 sermons by Edmund Clowney. Clowney was professor and president of Westminster Theological Seminary, a theologian-in-residence at Trinity Presbyterian Church in Charlottesville, Virginia, an associate pastor of Christ the King Church in Houston, and spent the last 12 years of his career at Westminster Seminary California. Clowney was also a prolific author, having authored some books that are considered classics, such as The Unfolding Mystery; Discovering Christ in the Old Testament, How Jesus Transforms the Ten Commandments, Preaching and Biblical Theology and Preaching Christ in All of Scripture. His book Called to the Ministry is perhaps one of the best books that examines the issue of being called into ministry. And his book The Church is certainly one of the best, if not the best book, on the nature and purpose of the church according to God’s design — a much needed book in this day when the purpose and design of the church seems to be lost on many. Bloggers, the 2008 GodblogCon audio has been posted. I have listened to two messages so far — not sure if I’ll get to the rest since I don’t really consider myself a blogger. I’m more of a ‘vocal iPoder’ than a blogger. I’m not interested in monitoring debates, conversations, or trying to gain an income from blogging. But many of you might be, and so this conference is something you should investigate.